Christ centered transitional housing for women and children. The Shepherd’s Gate Programs offer an opportunity for women and children to escape cycles of addiction, homelessness and abuse and to find lasting change through care of the whole person. Shepherd’s Gate is a Christ-centered program that provides a comprehensive approach to learning the skills needed to live independently in the community. We welcome women (single or with children) who are seeking a structured program to heal from the hurts of the past and gain the services they need on the road towards recovery. 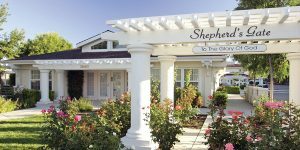 Shepherd’s Gate offers three programs to meet the varying level of needs. Women (single or with children) enter Shepherd’s Gate through the Short Term Program, which can range from 45-60 days. The Short-Term Program is designed to address the immediate needs of the woman and introduce her to recovery and life at Shepherd’s Gate. The Short-Term Program allows for the opportunity to establish long-term goals, discover areas of need and allow for a time of rest and healing. This is accomplished through intentional structured time away from distractions. Upon completion of the Short-Term Program, women are eligible to apply for the Long-Term, Road to Freedom Program. The Road to Freedom program is designed to help women break free of the destructive cycles from their past and find healing and restoration. This 12-18 month program includes comprehensive education and life skills classes, 12-step recovery, job skills training, Bible studies, structured and caring childcare and Case Management, which assess the need for additional referrals such as counseling, support groups, financial and debt recovery support, and legal assistance. The Working Women Program is for women (single or with children) who live a clean and sober lifestyle and are seeking additional support to break the cycle of homelessness. This program provides women who are working at least 20 hours/week the ability to gain long-term stability through a supportive, structured and safe environment. This 6-month residential program includes Case Management, financial management skills and accountability, job skills training, Bible studies and limited childcare if needed. Are you familiar with Shepherd's Gate? Help FreeRehabCenters.org users find out answers. I can get 30/60 days sober from alcohol then drink again. I’ve had so many reprocussions from drinking I can’t seem to stay sober longer than a few months. I’ve lived in 4 diff sober living homes and always manage to stay sober while living in them. I work full time as a lab assistant.